The Mesa Boogie Throttle Box is a distortion pedal perfectly matched for all genres of rock and metal. It has the capability to cover both vintage and modern distortion sounds, courtesy of the Lo/High Gain switch, and can transform your amplifier into a high-gain monster. The Throttle Box features a Mid-Cut control which offers the modern mid-scooped distortion tone, along with an internal EQ-Boost switch for another style/voicing option. The master level control can provide up to 20dB of boosted sound, while the true bypass circuit ensures you'll maintain optimum signal clarity when the pedal is disengaged. 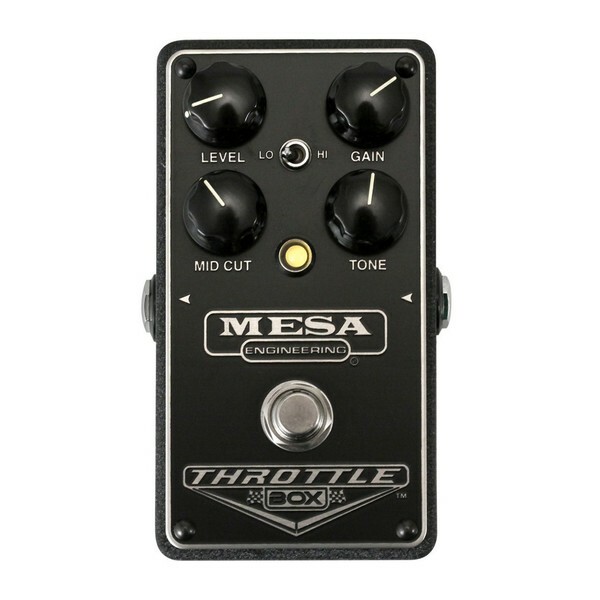 If you've always desired the classic high-gain Mesa Boogie tone, the Throttle Box gives you instant access to that sound in a compact and rugged pedal. The Mesa Boogie Throttle Box is a high-gain pedal that can cover the complete distortion range from vintage to modern, letting you play all styles of rock and metal. It features a Lo/High gain switch which alters the pedal's distortion response, along with an internal EQ-Boost switch for an additional voice. The Throttle Box is designed to turn any amplifier into a high-gain monster, giving you instant access to the acclaimed distortion sound of Mesa Boogie. The Throttle Box features a Mid-Cut control which provides a mid-scooped sound for a modern metal tone. An additional Tone control lets you balance the pedal's high frequencies, while the master Level control provides up to +20dB of boosted signal to push your amplifier into increased saturation and sustain. The Throttle Box has a true bypass which means you'll maintain optimal signal clarity when the pedal is disengaged. It is designed and handcrafted in Petaluma, California, and features the renowned build quality and rugged construction standards that Mesa Boogie is known for. Read the full review on the Music Radar website. "This is the pedal for every guitar player who has wished there was a way to step on a switch and turn their clean sound into something akin to Mesa’s mighty Rectifier. The mid-cut knob affects the soundscape in the same way as creating a V shape with Mesa’s five-slider EQ, and a center toggle drops the Throttle Box into low gear for cutting but clear overdrive and edgy blues styles." Read the full review on the Guitar World Magazine website.